What is Dysport™ used for? 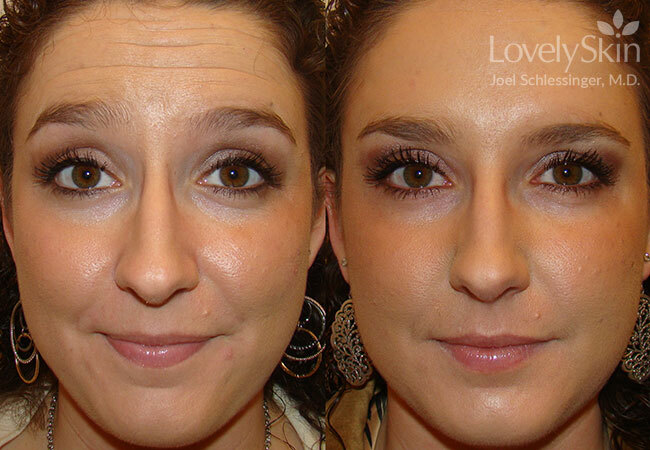 Dr. Schlessinger can improve your frown lines and crows feet with Dysport. Longer lasting, quicker to take effect, and less expensive than BOTOX® - that's Dysport™ - an in-office treatment for unwanted wrinkles. Board-certified dermatologist, Joel Schlessinger, M.D., of Skin Specialists and LovelySkin.com was privileged to conduct the largest ongoing clinical trial of this new product in his clinical research center in Omaha, Nebraska. Having the most experience with Dysport™ of any cosmetic surgeon in the nation, Dr. Schlessinger is the natural choice to go to for this new wrinkle relaxer. Dysport™ is a newly FDA-approved wrinkle relaxer. From frown lines to crow's feet, it can lift your spirits and improve your wrinkles at the same time. With a few tiny injections Dysport™ will take effect over a period of days to banish frown lines and many other telltale signs of aging. Dysport™ (pronounced DIS-port) is a new form of botulinum toxin A, similar to Botox, but slightly different in several ways. It takes effect quicker and lasts longer and, for the time being, is priced at a very attractive cost to the consumer. Dysport™ is used to smooth frown lines and wrinkles between the eyebrows and on the forehead, known as glabellar lines. Dysport™ can also smooth crow's feet around the eyes. 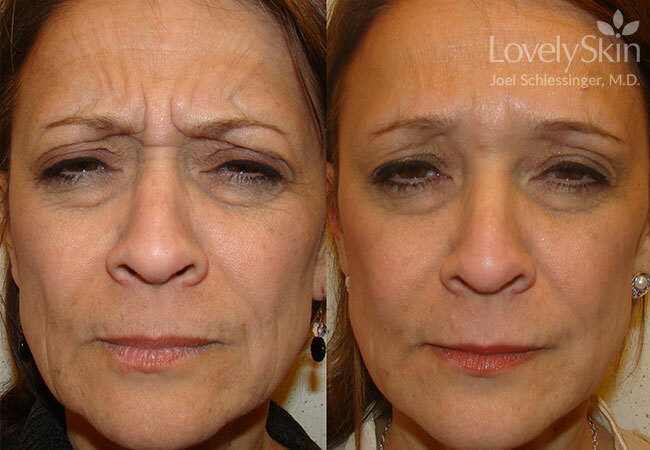 From frown lines to crow's feet, it can lift your spirits and improve your wrinkles at the same time. Frown lines or wrinkles form because the muscles that control your facial expressions are used often, sometimes resulting in a habit. When you frown or smile or laugh, those facial muscles tighten over and over. When Dysport™ is injected, the nerves that control facial expression are inactivated, which allows the muscles to relax for up to 4 months. Talk with Dr. Schlessinger prior to your procedure about your goals for using Dysport™ and feel free to ask any other questions regarding cosmetic procedures. Dr. Schlessinger and his patient coordinator are very willing to answer questions and want to hear from you if you have any. If you want to reduce the appearance of wrinkles around your eyes and on your forehead, Dypsort may be an outstanding choice. Your results will depend on your overall goal and suitability. Dr. Schlessinger is very good about letting patients know if they are good candidates for treatments. In Dr. Schlessinger's patients, and during clinical trials, he saw results as quickly as 2 to 3 days in most of his patients. The national study that he participated in showed Dysport™ lasts longer (up to 4 months) than its competitor Botox (which generally lasts about 3 months). Before and after Dysport, Perlane, Restylane. Dr. Schlessinger will perform the injections. In Dr. Schlessinger's Midwest office, the only individual who works on you is the doctor - no nurses or other staff members administer Botox, Dysport™, or fillers as is the practice in many other offices. Dr. Schlessinger is very proud of the results he obtains, and this is one of the reasons he has been voted Best Cosmetic Surgeon in Omaha, Nebraska for 9 years in a row. The actual injections are quick and nearly painless with the use of numbing topically and Dr. Schlessinger's excellent technique. Botox, a registered brand name for botulinum toxin A produced by the company Allergan, has been alone in the market for this type of product until the introduction of Dysport™. Medicis is the company that makes Dysport™. Only Dysport™ and Botox have been approved by the FDA. Having treated over 1,500 patients with Dysport™ during clinical trials in his private practice, Dr. Schlessinger says Dysport™ lasts longer than Botox, in general. "Where Dysport™ is going to perform particularly well is the upper forehead area," according to Dr. Schlessinger. "I think it will take care of those pesky wrinkles on the upper forehead that sometimes didn't get treated well with Botox. On the other hand, I am still using quite a bit of Botox, and many patients will continue to enjoy Botox for many years. It all comes down to having new and exciting choices and competition. This drives prices down and allows more patients to access these great treatments!" Other products can reduce wrinkles in additional areas of your face. 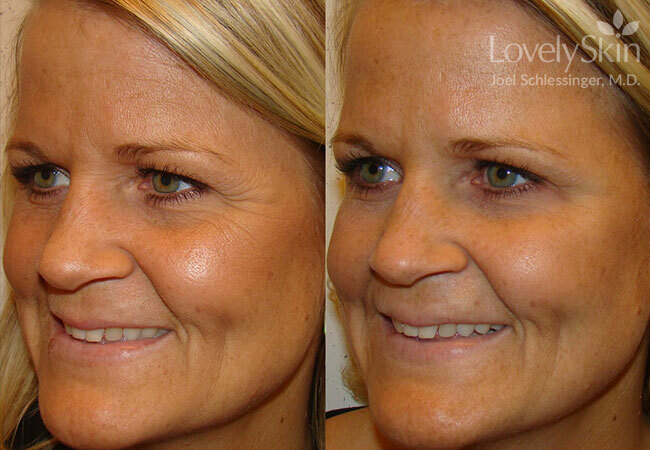 See the discussion on this Web site on Restylane®, JUVEDERM® and BOTOX®. Dr. Joel Schlessinger is a board-certified dermatologist and board-certified cosmetic surgeon in private practice in Omaha, Nebraska. He is President Emeritus of the American Society of Cosmetic Dermatology and Aesthetic Surgery. The Medical Director of LovelySkin.com and Skin Specialists, PC, Dr. Joel Schlessinger says, "The one drawback of Dysport™ is that it acts a little more finicky than Botox, and, for that reason, it may cause problems in untrained hands. This means that it is probably best to go to someone who has good experience (not a Medispa or someone who is just learning to do these procedures)." Dysport™ shouldn't be used if you are pregnant or breast feeding and should be avoided if you have a history of myasthenia gravis or other muscular disorders. While it contains lactose, it isn't absorbed by the GI tract so it is okay to use even if you are lactose intolerant. Dysport™ is approved by the FDA for adults younger than 65, but that doesn't mean that patients older than 65 can't use it. Talk with Dr. Schlessinger during your consultation or your doctor about whether this procedure is right for you. Dysport™ contains both lactose and albumin, but according to Dr. Joel Schlessinger, "It is unlikely that the lactose in the Dysport™ will result in any problems for individuals who are lactose intolerant due to the fact that lactose intolerance is specific for gastrointestinal enzymes and isn't an allergy per se." 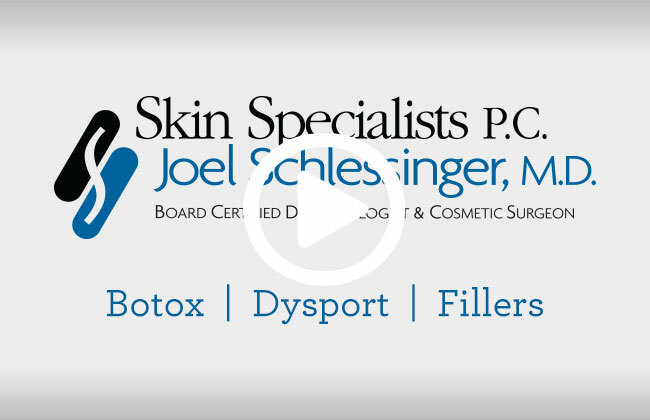 Dr. Joel Schlessinger participated in the clinical trials of Dysport™ and has the largest clinical experience with this treatment of any dermatologist or cosmetic surgeon in the United States. Period. In his research practice, he had the highest number of patients on Dysport™ prior to its approval than any other clinic in the U.S., having injected over 1,500 patients with Dysport™ over the past 5 years.